ეს არის გამოქვეყნებული ვერსია, შემოწმებული 19 იანვარი 2019. აქ არიან 4 შემოწმების მოლოდინში მყოფი რედაქტირებები. 2018 წლის რუსული საფოსტო მარკა მსოფლიო საფეხბურთო ჩემპიონატი 2018-ის B ჯგუფის მონაწილე გუნდებით. 2018 წლის მსოფლიო საფეხბურთო ჩემპიონატის B ჯგუფის მატჩები 2018 წლის 15-დან 25 ივნისამდე პერიოდში გაიმართა. ამ ჯგუფში წარმოდგენილნი იყვნენ პორტუგალია, ესპანეთი, მაროკო და ირანი. საუკეთესო შედეგის მქონე ორმა გუნდმა მერვედფინალში გააგრძელა ასპარეზობა. ↑ ფინალური კენჭისყრისთვის გუნდები განთესილები იყვნენ 2017 წლის ოქტომბრის რეიტინგის მიხედვით. B ჯგუფის გამარჯვებული ესპანეთი შეხვდება A ჯგუფის მეორეადგილოსან რუსეთს. B ჯგუფის მეორეადგილოსანი პორტუგალია შეხვდება A ჯგუფის გამარჯვებულ ურუგვაის. 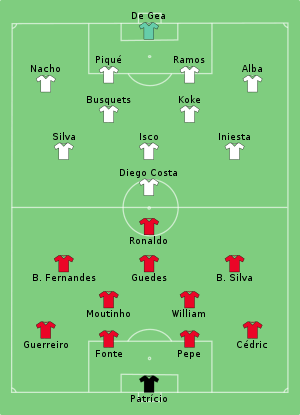 The two teams had met in 35 previous matches, including in the round of 16 of the 2010 World Cup, won by Spain 1–0. Cristiano Ronaldo scored with an early penalty, winning it after he was fouled by Nacho inside the box. Diego Costa then twisted and turned away from two Portugal defenders to score with a low shot to the left corner which brought the two sides level. But just before the break, David de Gea fumbled a Ronaldo shot from outside the penalty box through his gloves and over the line. Costa scored his second equaliser of the night just after the restart from close range before Nacho scored with a right foot half-volley in off the post from the edge of the penalty box, his first goal for Spain. As the clock ticked down, however, Gerard Piqué brought down Ronaldo just outside the box, with the Portugal star completing the scoring and his hat-trick with a free-kick into the top right corner of the net. Ronaldo became the fourth player to score in four different World Cup tournaments (2006, 2010, 2014 and 2018) after Pelé, Uwe Seeler and Miroslav Klose, and also the first to score in eight consecutive World Cups and European Championships. At age 33, Ronaldo also became the oldest hat-trick scorer in the World Cup, surpassing Rob Rensenbrink of the Netherlands, who scored three times against Iran in 1978, aged 30. With this result, Spain has not won any opening matches since 2006, having lost to Switzerland 0–1 in 2010 and the Netherlands 1–5 in 2014. 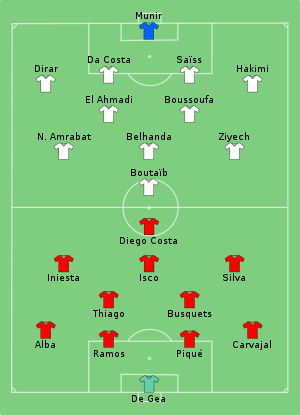 The two teams had met previously only once, a group stage game in the 1986 FIFA World Cup, won by Morocco 3–1. João Moutinho swung in a cross from the right after a short corner and Cristiano Ronaldo headed the ball powerfully past goalkeeper Munir Mohamedi from six yards out and into the middle of the goal to open the scoring in the 4th minute. Ronaldo played Gonçalo Guedes into the box but Munir made a one-handed save. Ronaldo shot over the crossbar when Bernardo Silva's mishit presented him with a shooting chance on the edge of the box early in the second half. Rui Patrício then made a save to preserve Portugal's lead when Hakim Ziyech's free-kick was headed towards goal by Younès Belhanda, the goalkeeper diving to palm the ball away from danger. Ziyech shot another set-piece just over the crossbar from 25 yards. Nordin Amrabat and Medhi Benatia fired over with better chances. With their second loss in a row, Morocco became the first team eliminated from the 2018 FIFA World Cup. 85 international goals for Ronaldo is a new record for a European player, with Ronaldo passing Ferenc Puskás to hold the record outright. Ronaldo has become the first Portuguese player since José Torres in 1966 to score a goal with his right foot, left foot and head in a single World Cup tournament. Ronaldo is the first player to score five consecutive World Cup goals for his team since Oleg Salenko for Russia in 1994. Spain had their first attempt on goal in the 25th minute when David Silva's long-range free-kick was held by Alireza Beiranvand. Five minutes later, Silva's volley sailed narrowly over the crossbar from six yards out. At the start of the 2nd half, Gerard Piqué's close-range effort was blocked and then Beiranvand palmed away Sergio Busquets' curled effort from the edge of the penalty area. Karim Ansarifard's effort from a corner flashed into David de Gea's side netting. After 60 seconds, Diego Costa picked up Andrés Iniesta's pass inside the area and saw Ramin Rezaeian's attempted clearance ricochet off his leg and past Beiranvand. Saeid Ezatolahi pulled Iran level shortly after the hour but his close-range finish after a scramble was ruled out courtesy of VAR after Rezaeian was found in an offside position. Mehdi Taremi's back-post header fizzed over De Gea's crossbar seven minutes from time as Iran pushed for an equaliser, but Spain held on for a 1–0 win. Iran did not manage a shot on target for the first time in 14 World Cup games. 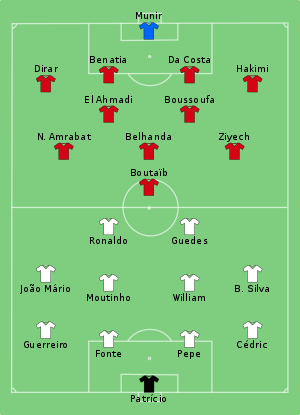 The two teams had met twice, most recently in a group stage game in the 2006 FIFA World Cup, won by Portugal 2–0. In the 45 minute, Ricardo Quaresma cut in from the right before scoring with a curling shot off the outside of his right foot that looped over Alireza Beiranvand into the top-left corner. Saeid Ezatolahi's foul on Cristiano Ronaldo won Portugal a penalty, which Ronaldo shot low into the right, enabling Beiranvand to get down and make a stop. Iran then managed to get a penalty in stoppage time after referee used VAR to determine that Cédric's handball from Sardar Azmoun's header had been intentional, which Karim Ansarifard converted high to his right. 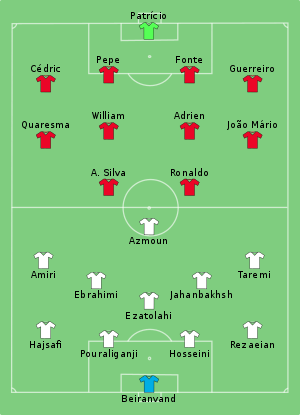 The game ended in a 1−1 draw, with Portugal advancing and Iran eliminated. Quaresma (34 years, 272 days old) is the oldest player to score on his first World Cup start since Yahya Golmohammadi (35 years, 84 days old), who did so for Iran in 2006 against Mexico. Iran's goal - scored after 92 minutes and 48 seconds - was the latest goal Portugal have ever conceded at the World Cup. Iran are the second Asian nation in World Cup history to have won their first match at a World Cup but be eliminated at the group stage, after South Korea in 2006. This was Iran's best performance ever in the FIFA World Cup, winning four points and having earned their first ever draw against any European opponents since 1978, when Iran drew 1–1 to Scotland. Despite their geographical proximity, the two teams had faced each other only in two opportunities, both were in the 1962 FIFA World Cup qualification and won by Spain. In the 14th minute, a mix-up between Sergio Ramos and Andrés Iniesta allowed Khalid Boutaïb to steal possession on the halfway line, burst through on goal and finish through the legs of David de Gea. Iniesta and Diego Costa combined to set up Isco for a close-range finish that tied the scores five minutes later. Boutaïb was clear again in the 25th minute when Morocco took a quick throw-in, but De Gea stopped the ball. Nordin Amrabat, Manuel da Costa and Mbark Boussoufa were all booked in three-minute period before Sergio Busquets headed over the crossbar from Isco's corner. Amrabat's strike from at least 25 yards out bounced off the woodwork in the 55th minute. Isco's looping header dipped under the crossbar, but Romain Saïss made a clearance, Gerard Piqué heading wide from the resulting Isco corner. Youssef En-Nesyri scored home a header to give Morocco the lead. And when Iago Aspas turned home Dani Carvajal's cross from the right after a short corner – the goal given by VAR after a long delay – Spain was tied in the first minute of added time. Boutaïb's goal for Morocco was their first goal at the finals since 1998, when Salaheddine Bassir scored in a 3–0 win over Scotland. Ramos made his 16th appearance for Spain at the World Cup, overtaking Xavi as their most capped outfield player in the competition. Spain have failed to win their final group game at a World Cup for the first time since 1982, having won the previous eight such games. ↑ 2018 FIFA World Cup – Statistical Kit. FIFA.com. ↑ 7.0 7.1 Ronaldo illuminates stellar draw with Spain. FIFA.com (15 June 2018). ↑ 8.0 8.1 Smith, Jamie. (15 June 2018) Brilliant Ronaldo hat-trick earns thrilling draw. Goal.com. ↑ 9.0 9.1 Jennings, Patrick. (15 June 2018) Portugal 3 Spain 3. BBC Sport. ↑ 13.0 13.1 13.2 2018 FIFA World Cup – Statistical Kit. FIFA.com. ↑ 14.0 14.1 Creek, Stephen. (20 June 2018) Record-breaker Ronaldo sends Renard's men out. Goal.com. ↑ Ronaldo grabs winner, Morocco eliminated. FIFA.com (20 June 2018). ↑ Bevan, Chris. 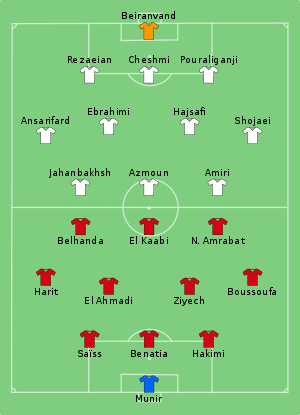 (20 June 2018) Portugal 1 Morocco 0. BBC Sport. ↑ Atkinson, Guy. (20 June 2018) Costa goal breaks stubborn resistance. Goal.com. ↑ Costa on target to give Spain victory. FIFA.com (20 June 2018). ↑ Reddy, Luke. (20 June 2018) Iran 0 Spain 1. BBC Sport. ↑ Walker, Shaun. (25 June 2018) Iran close to stunning Portugal but Quaresma goal is enough. The Guardian. ↑ Portugal survive with dramatic draw. FIFA.com (25 June 2018). ↑ Ridge, Patric. (25 June 2018) Santos' men survive late Saransk scare after Ronaldo penalty miss. Goal.com. ↑ Henry, Matthew. 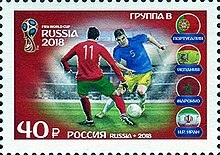 (25 June 2018) Iran 1 Portugal 1. BBC Sport. ↑ Spain top group after thrilling finale. FIFA.com (25 June 2018). ↑ Smith, Jamie. (25 June 2018) Spain tops group despite dramatic draw. Goal.com. ↑ Whalley, Mike. (25 June 2018) Spain 2 Morocco 2. BBC Sport.